Some women's health problems are related to low or unbalanced female hormones. Below are some of the herbs that have been used to help decrease the symptoms. Please consult your private healthcare provider before trying these herbs. Black Cohosh Root: The popular herb black cohosh comes from the root of the North American forest plant cimicifuga racemosa. Also known as 'black snakeroot', 'bugbanc', 'bugwort', and 'squawroot', Black cohosh has an extensive history of safe use by Native Americans who revered it as a remedy for a host of common ailments. Native Americans employed black cohosh as an effective treatment for fatigue, neuralgia, rheumatism, sore throat, asthma, bronchial spasms, bronchitis, and whooping cough. Mixed with chamomile, ginger, and raspberry leaf black cohosh has been used for centuries by women to stimulate menstrual flow, case the strains of childbirth, and confer relief from the symptoms of menopause. In Europe black cohosh products are regularly used in the treatment of premenstrual s syndrome (PMS) and menopause. Contemporary herbalists also hold black cohosh in high regard as an antispasmodic for relief from cramps, muscle pains, and menstrual pains. With its mildly sedative and relaxing effect, black cohosh is used also to treat anxiety and nervousness. Modern herbalists also recommend black cohosh as a cough suppressant and expectorant, a diaphoretic for eliminating toxins, and they consider it to be an excellent treatment for lowering high blood pressure. Researchers studying black cohosh have isolated chemical derivatives mimicking the effects of estrogen, supporting the use of the herb in the treatment of female conditions. Black cohosh was found to contain the glycoside 'acetein', a steroidal derivative that is effective in lowering blood pressure in animals. While some supporters claim the same effect in humans, no research is available to verify this. Researchers have also determined that black cohosh contains compounds that support its uses as a sedative and an anti-inflammatory agent. Burdock Root: This herb contains B vitamins, vitamin E, and minerals such as potassium, phosphorous, chromium, cobalt, iron, magnesium, silicon, zinc, and sodium. It provides inulin, a helpful sugar for diabetics and hypoglycemics because it does not elicit rapid insulin production. Both European and Chinese herbalists have long considered burdock root's lightly warming, moistening effect an excellent tonic for the lungs and liver. It also reportedly stimulates toxic waste through the skin and urine and improves digestion. The Chinese use burdock root as an aphrodisiac, tonic, and rejuvenator. Some say it is good against arthritis and rheumatism. The anecdotal beneficial effects of this herb include increasing circulation to the skin and helping to detoxify the epidermal tissues. It has been used in treating psoriasis and acne, among other skin conditions. Burdock root has been reported to destroy bacteria and fungus cultures. Anti-tumor properties have also been reported. Burdock is one of the finest blood purifiers in the herbal system. It is classified as an alternative diuretic and diaphoretic. It helps the kidneys to filter out impurities from the blood very quickly. It can also help clear congestion in the respiratory, lymphatic, urinary, and circulatory systems. 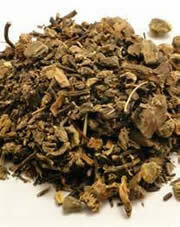 Dandelion Root: This herb is a very effective natural diuretic rich in potassium and is a good source of plant protein. Dandelion root can be beneficial for liver problems and is known to detoxify poisons from the liver, which is important for proper liver function. Dandelion is high in the natural good salts the body requires for proper functioning. It has been found to help reduce stiffness in the joints and help to reduce serious cholesterol and uric acid. In Europe dandelion is used in treating diabetes. Dandelion is a superior blood purifier for the entire body. 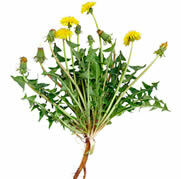 Benefits of dandelion root also include improvements in acne, age spots, anemia, arthritis, asthma, high blood pressure, hypoglycemia, eczema, gallbladder symptoms, hepatitis, jaundice, kidney infection, skin problems, and weight loss. Dandelion root acts as a mild diuretic and a tonic to relieve the fatigue a woman often experiences when her hormone levels are high or unbalanced. Dong Quai Root: This is a very good tonic herb for women and children, the elderly, or general debility. It is said to strengthen the heart. Its has been shown to prevent the decrease of liver glycogen and protect the liver. Dong quai root has an antibacterial action, preventing the growth of various bacteria. The root contains vitamin B12, zinc, thiamine, riboflavin, potassium, magnesium, iron, fructose, glucose, and many trace minerals. Externally dong quai is used as a medicinal gargle for sore throats and mouths and as a medicinal poultice for broken bones, swellings, itching and rheumatism. Ongoing scientific research is indicating the use of dong quai in preventing or curing Alzheimer's, diabetes, stroke, heart disease, cancer, schizophrenia, loss of intimate desire (aphrodisiac), especially in women, depression, anorexia, leukemia, PMS, kidney disease migraine headache, ADD and more. Wild Yam Root: In herbal medicine wild yam is a remedy that may be used to ease dysmenorrhea with ovarian and uterine pains. It may also be helpful in the nausea of pregnant women. This valuable herb was at one time the sole source of the chemicals that were used as the raw materials for contraceptive hormone manufacture. Wild yam root is an antispasmodic. Traditional herbalists recommend it to provide relief for bilious colic and other forms of colic including colic with spasmodic contractions, and to soothe diverticulitis. It may also be valuable with painful cholera morbus with cramps, neuralgia affections, spasmodic hiccups, and spasmodic asthma. Wild yam root is also used as an anti-inflammatory. It is of great use in the treatment of rheumatoid arthritis, especially the acute phase where there is intense inflammation. Of course the herbs mentioned above should not be taken during pregnancy or while nursing without a doctor's consent. I always recommend everyone consult their private healthcare provider before taking any health products or supplements. As previously stated, the herbs mentioned above may help with some of the symptoms of menopause and PMS, however, they will not restore the hormones estrogen and progesterone to a more healthy level to help with anti-aging. Please see our Estrogen & Progesterone product if you are interested in relieving the symptoms of menopause while helping your body to improve and balance these important female hormones that decline with age. Please note: Restoring human growth hormone to a more healthy and youthful level may have a positive effects on other hormones in the body such as E and P. Click for more information about HGH and menopause and for more information about our HGH products.